Whether you call it the living room or the lounge, it’s still one of the most important rooms in the house. It’s the main space where you and your loved ones can relax. It’s a room where people converge and a room which people will always remember. These simple DIY projects will make your living room unique. They will make your guests leave your living room with a great impression. The crate coffee table is a very simple design made up of four wooden crates and a piece of plywood. Once put together, it creates a unique coffee table with plenty of storage. It will become a decorative piece in the living room. It leaves a little hole in the middle of the table, which is great for a flower pot. Why not paint the coffee table to a colour which suits your decor? Own a dog or cat? Then this DIY project is perfect for you. You can create a comfortable bed for them which can be put in the living room. It’s made using old planks and can be on wheels too. Very useful for moving the bed when guests come over! Now your pets have their own little bed to sleep on instead of your lovely sofa. Make sure your pet gets the rest they deserve. wall decal which can be stuck onto several different surfaces. It’s a DIY project which can transform a room with ease by applying the decals in your space. They can be placed on the wall however suits you and the room. It can really bring a room to life when paired with a great colour of paint. 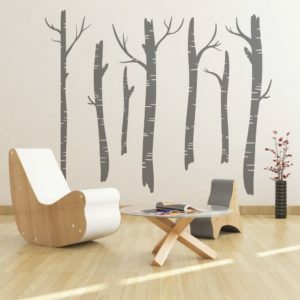 Bring a touch of the woods into your living with our Birch Tree Vinyl Wall Art. These shelves are in the shape of a honeycomb. The quirky shape is different and eye-catching. The shelf is made out of wooden planks and is a great storage unit to have on the wall. The beautiful piece is bespoke and beautiful. You can have several different sections to the shelves and change the size of the shelf to suit your space. This entry was posted in Interior Design and tagged interior design, living room.